The Grange is a Grade II listed building constructed in 1752 located on the Headingley Campus. For a number of years the building has been underutilised and has been left partially empty because of risks associated with a dilapidated building and poor standard accommodation. The University therefore decided that a major internal and external refurbishment be undertaken to restore the building to current standards but sympathetically restoring the original features of the building. Specialist UK Restorations were appointed by BAM Construction to carry out major structural support work to the timber roof after this was condemned by Structural Engineers. Arup were instructed by the University to provide a solution to ensure the roof structure was structurally sound for years to come. Their proposals included the installation of pre-fabricated steel hangers at 900mm centres fixed to steel channels (PFC’s) that were located to either side of the bottom truss member. 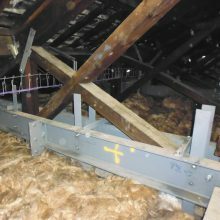 Due to the complexity of the project and the inconsistency of the building, all PFC’s and hangers were drilled in-situ in a tight roof space. Large sections of steelwork were manoeuvred around existing timber trusses making the project more difficult. Arup requested that all node points of the trusses should be adequately tied to prevent further movement or spread in the future. Due to the inconsistency of the timber trusses and the different strapping details that were required, this element constantly evolved and we had to work very closely with Arup to provide alternative solutions to any issues as they arose. As part of the project, we also carried out the necessary builders work including padstone installation not only to all the eaves locations, but also to the internal walls so that the channel lengths could be reduced making them more manageable within the roof space. Specialist UK Restorations simultaneously completed the partial re-pointing of the building together with the necessary stone restoration work. The project was completed within the required timescales and to the complete satisfaction of all parties.